Pebble+ is your private, secure personal online learning space. You can create records of learning, experience and achievement by noting your reflections and showcasing your knowledge, skills and attributes. Structured resources are on hand to prompt and guide you. PebblePad is an ePortfolio tool available to all staff and students via LearnJCU. Lecturers can provide a PebblePad link within the Subject Content, this will allow students direct access to their PebblePad dashboards at the time of need. Otherwise, students can also find it in 'Books & Tools' in the left-hand menu of your subject site under 'Details & Actions'. In subject sites still using 'Original' view, the PebblePad link can be found in 'Tools' in the left-hand menu. Learn how to create a resource and what happens when you complete a response. Get creative in PebblePad with Pages, Portfolios, Blogs, Logs and Collections. Everything in PebblePad is private unless shared - learn more on sharing your assets. Formatting text is a great way to personalise your assets in PebblePad. 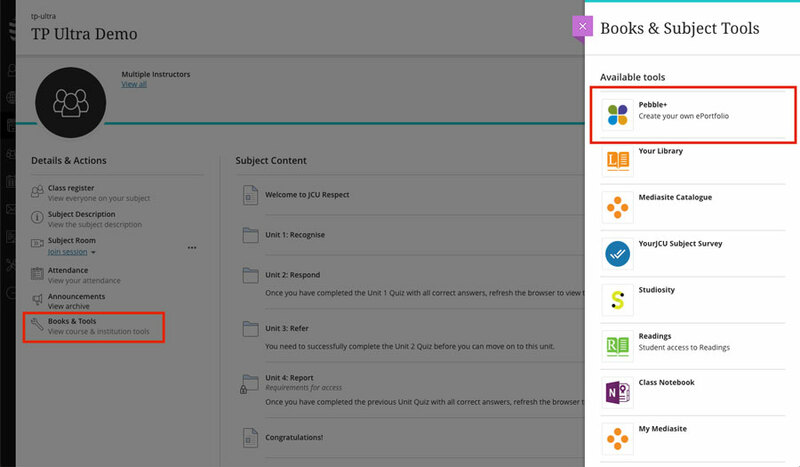 Learn how to locate, use and edit a workbook or template in PebblePad. If you're using PebblePad for an assessment in a subject you'll need to submit your assignment to PebblePad rather than LearnJCU for marking. Feedback on assessment submitted to PebblePad can be viewed using the ATLAS link. As video files are often too large to be easily uploaded and viewed in PebblePad. An easy solution is to first upload your video to a service like YouTube or Vimeo then link to the video in PebblePad. I get a blank screen when I click the Pebble+ link in my LearnJCU site? PebblePad opens in a new browser window and you will need to allow pop-ups so that Pebble+ can open. Can I take the assets I created in Pebble+ with me after I graduate? Yes, you can enable an alumni account which offers free, lifetime access to PebblePad including the assets you created at JCU.